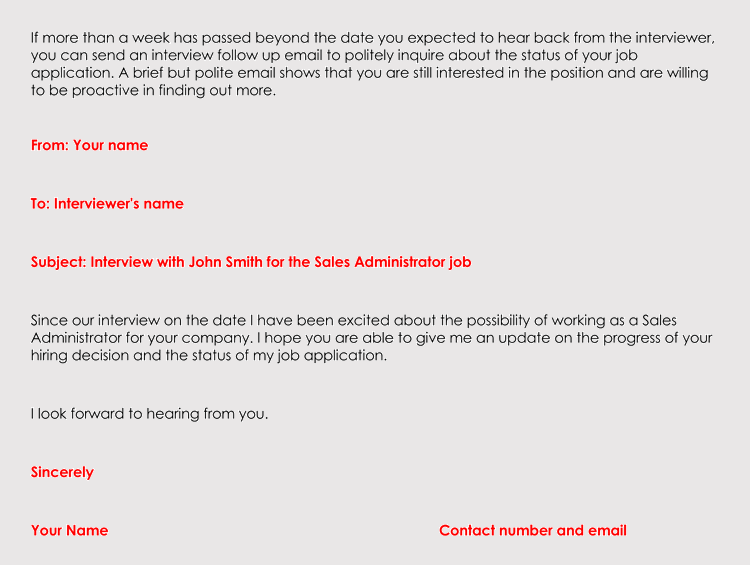 It can be very disheartening to send an application for a job and not hear from the hiring company. 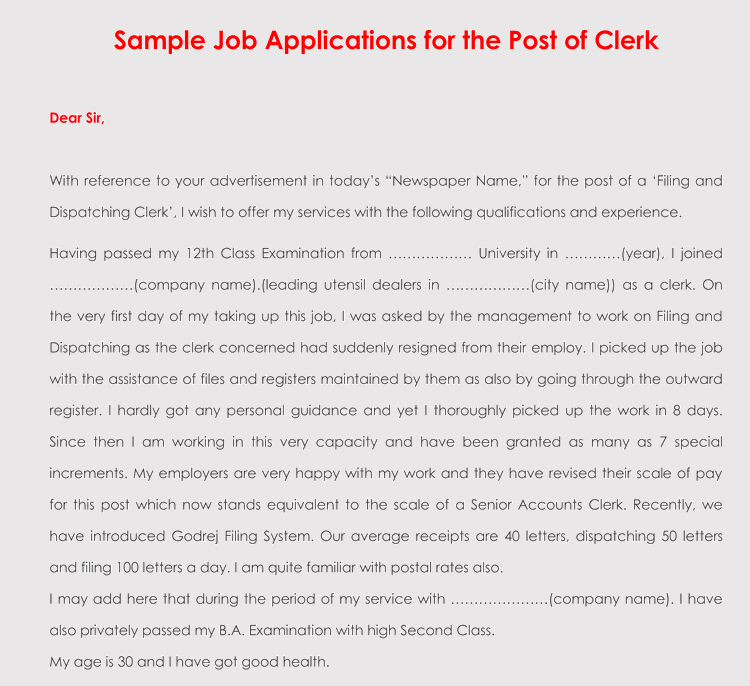 You can either decide to wait longer for the feedback or write them an inquire about the status of the job application. 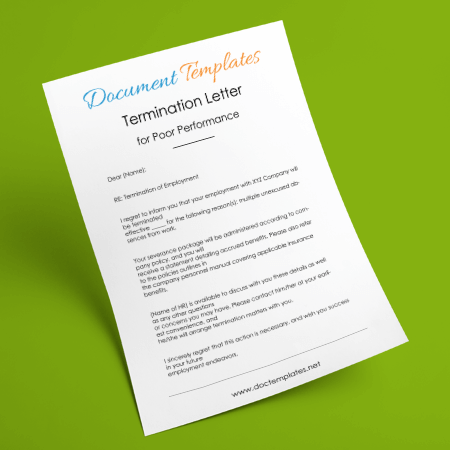 In case you choose to do a follow-up letter, you need to do it in a proper way such that the hiring managers don’t feel as if they are being stalked. Stalking won’t help either as the employer is looking for specific skills, qualifications and experience and if you qualify you’ll be hired. 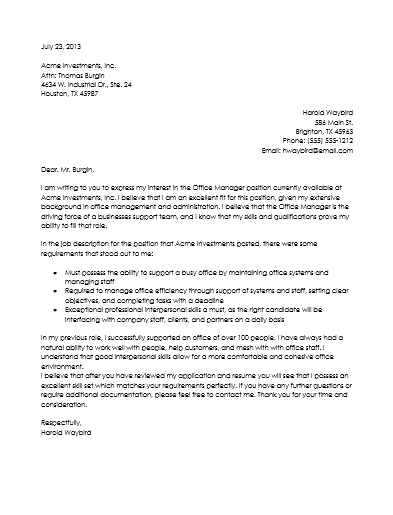 A follow-up letter for job application acts as a reminder to the hiring manager that you are interested in working with the company, and that you have the relevant skills. 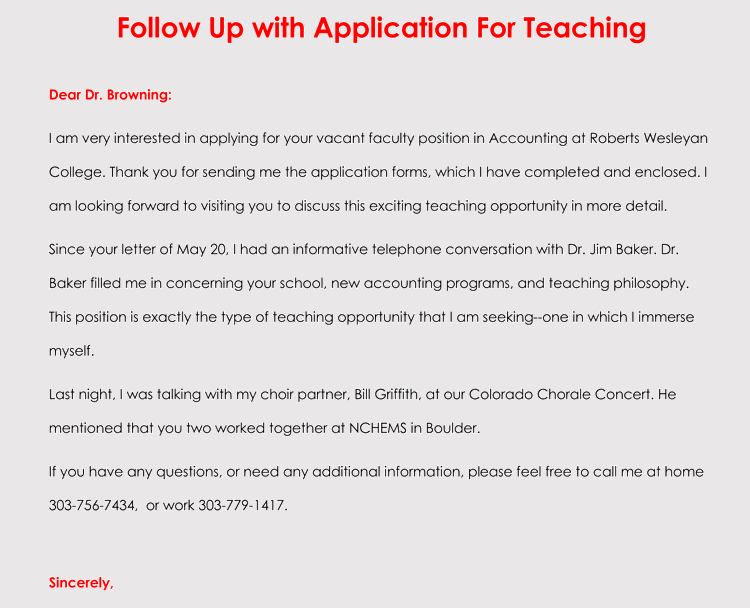 Wait for a few days before you send the letter as it will give them enough time to review your application. You can send it after one or two weeks. 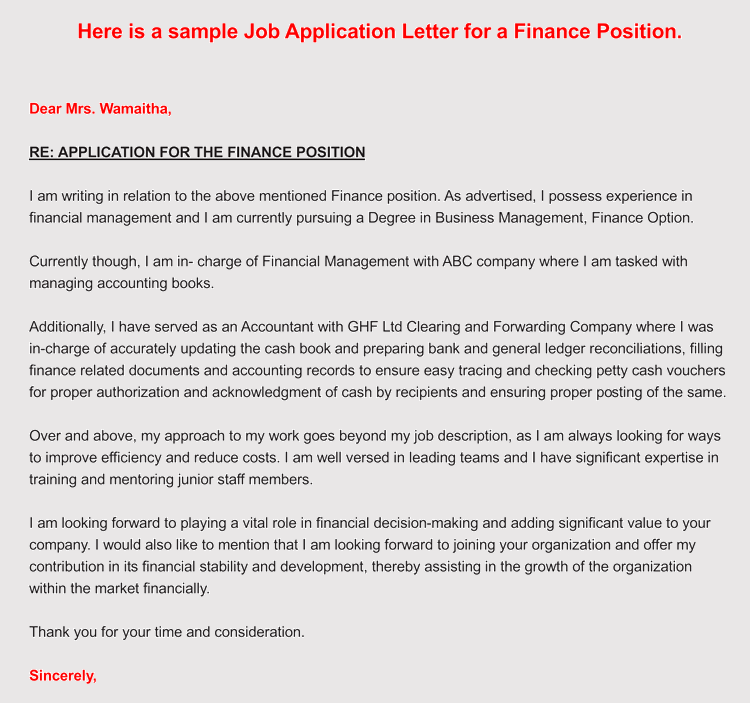 Be polite while writing the letter to avoid sounding as if you are accusing your prospective employer of forgetting or ignoring your application. Make them know that you understand that they are usually busy and maybe they forgot to get back to you on time. 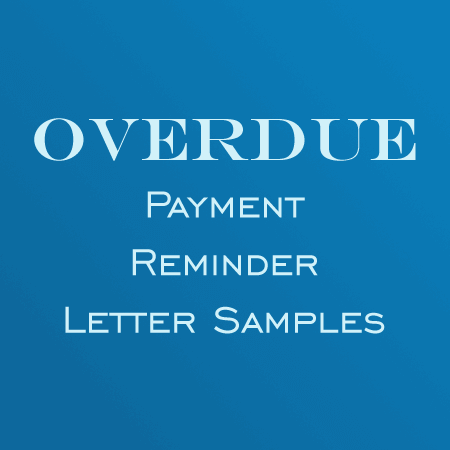 Use this tone throughout your letter. 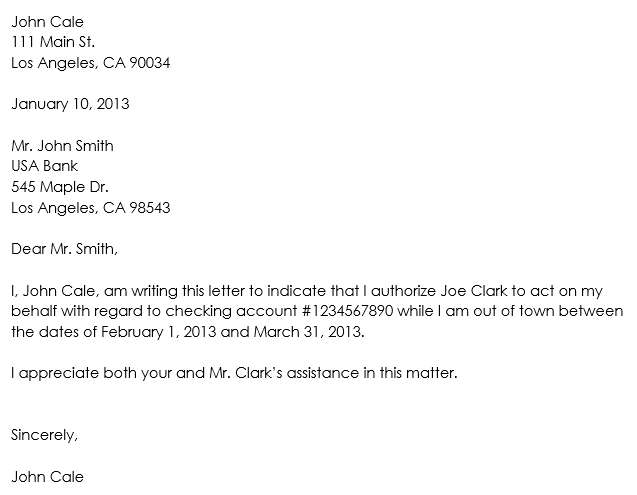 Make your letter very short and straightforward. 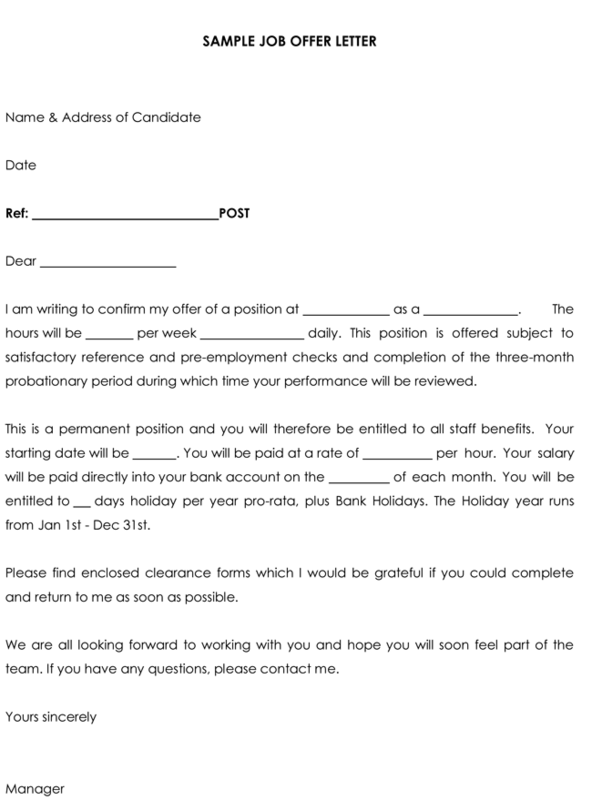 Remember, your prospective employer may be very busy reviewing other applications. Remember, you are not the only person seeking for employment. 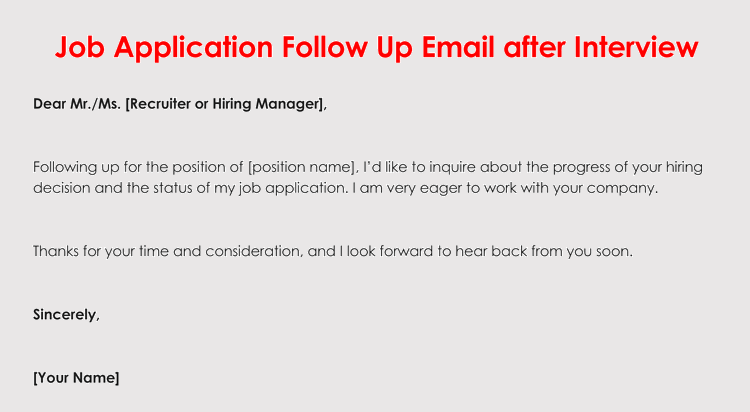 Be sure to reinforce your skills in your follow-up letter for job application. 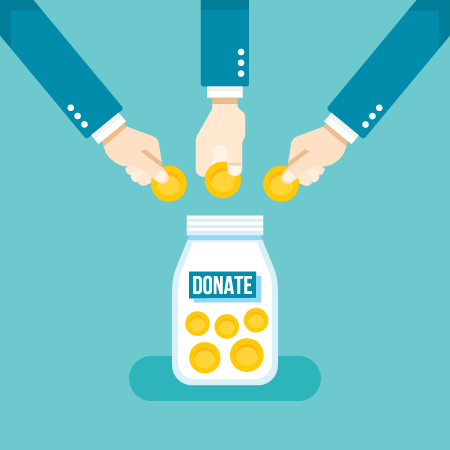 Make your skills stand out from those of other candidates. 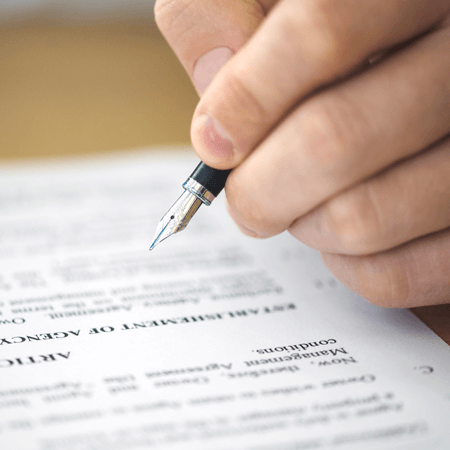 Ensure you proofread it and edit it where necessary to make it as professional as possible. Explain that you submitted an application for a job and the date of submission. 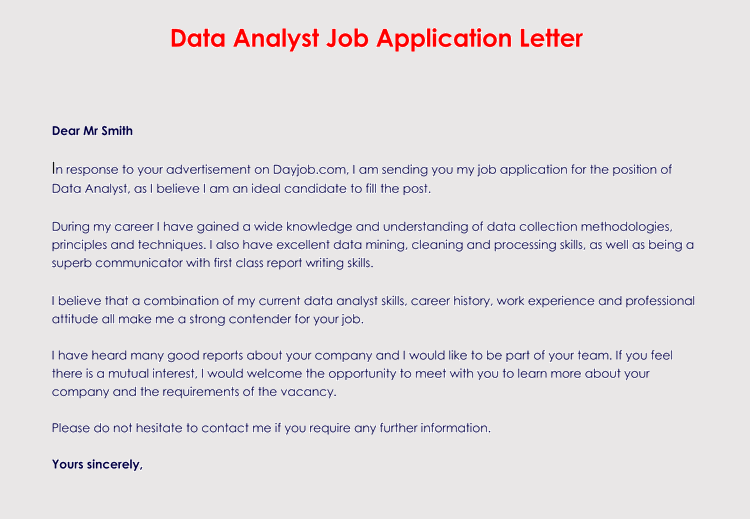 Mention the position that you applied for and that you have not heard since then. 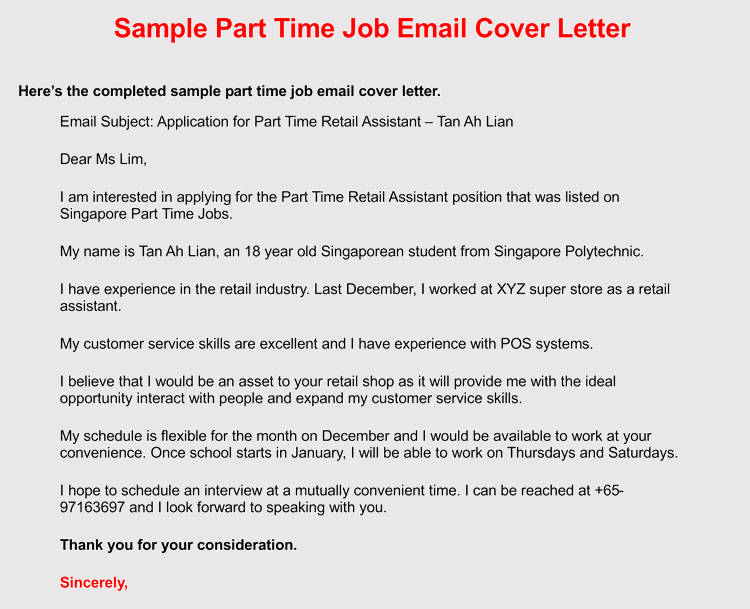 Enquire whether the letter was received and reiterate that you are still interested in the job. Use this paragraph to highlight your skills and experiences. Be sure to convince your prospective employer why you are the best. Explain how your skills and experiences will help you in that new position. You can give more details on how they can reach you. Also, inquire if there may be any other information they may need from you. Let them know their feedback will be highly appreciated. 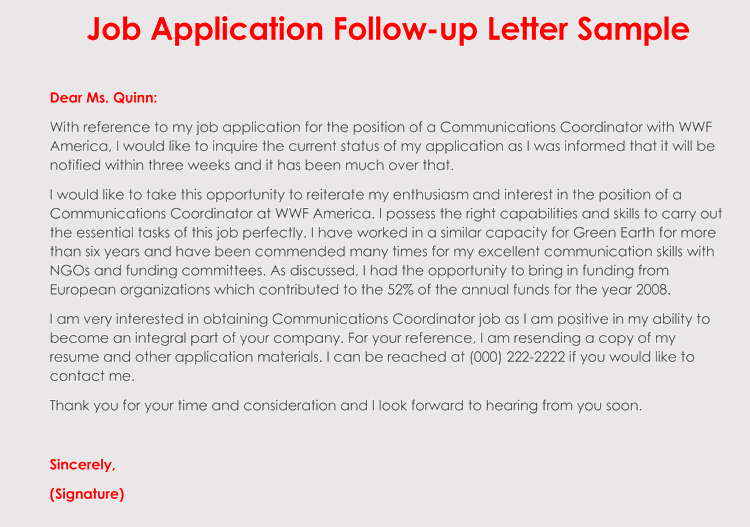 Below is a sample Follow-up Letter for Job Application that you can customize to fit any particular job or company. 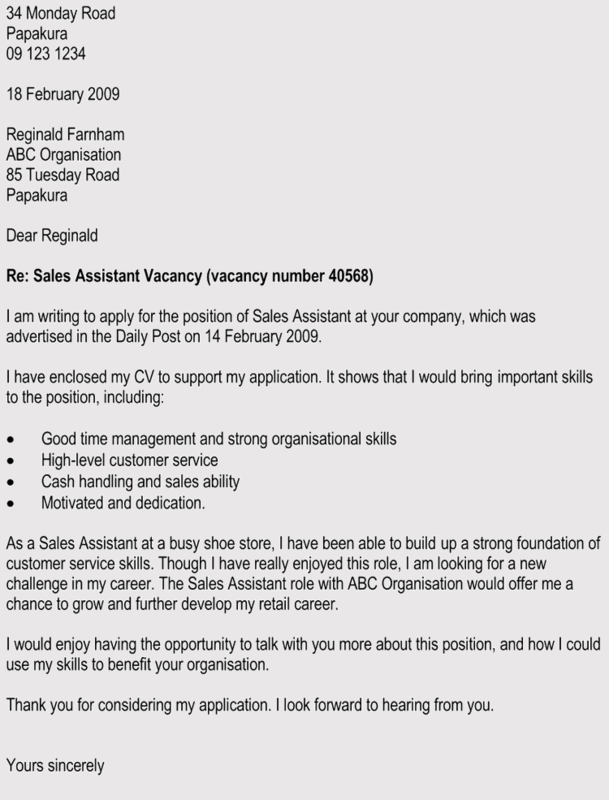 I made an application last Month for a position of Accounts Manager as advertised in the Local dailies. Up to date, I’m yet to receive any feedback from you. Please, confirm the receipt of the application. 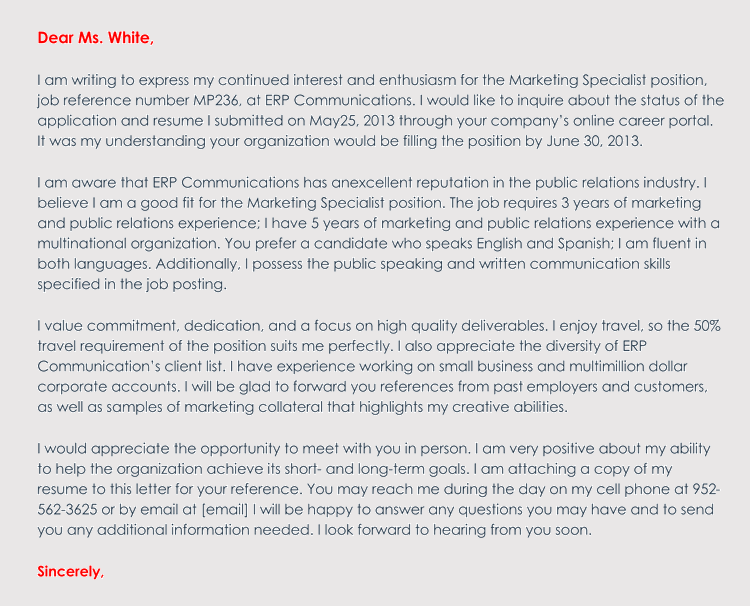 I would also like to reaffirm that I’m still interested in the position. I’m very interested in working with ABC Company, and I hope that my skills together with many years of experience fit very well for that Position. 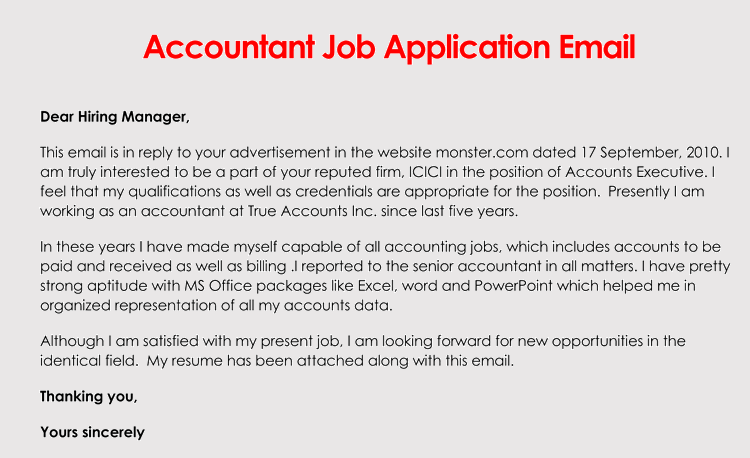 I have over eight years experience working as an Accounts manager with two different companies. This makes me an ideal candidate for that position. If there is any other information you would like to know from me, please don’t hesitate to let me know. 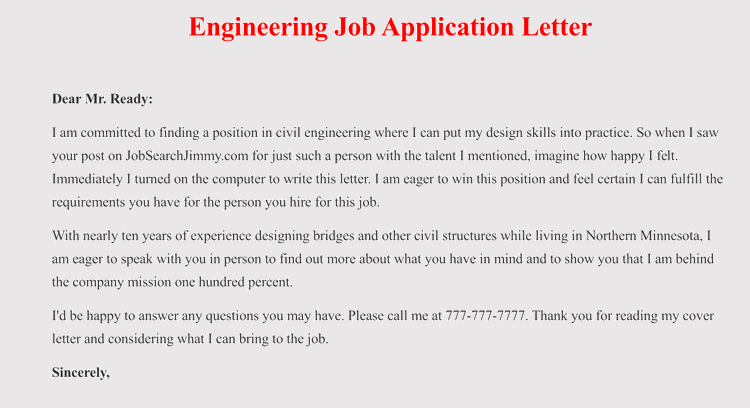 You can reach me through this email address chris1234@hotmail.com.Your feedback is highly appreciated.